1. Foreign travelers holding passports from countries other than the R.O.C., travel documents or R.O.C. passports without personal ID numbers attached. 2. 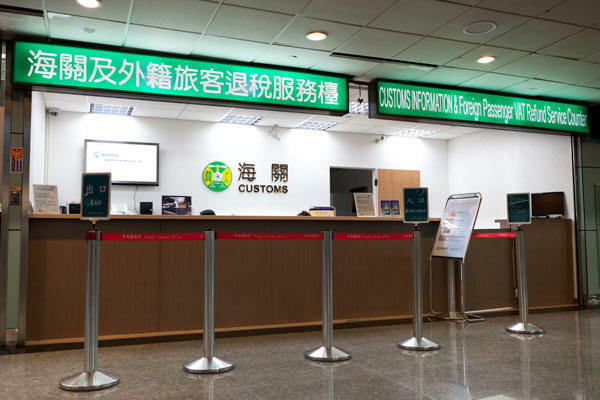 Foreign travelers who make purchases of at least NT$3,000 on the same day from the same Tax Refund Shopping (TRS)-posted store, are eligible for a refund of the 5% VAT paid on those purchased goods. To claim the refund, they must apply at the port of their departure from the R.O.C. within 30 days following the date of purchase, and they must take the purchased goods out of the country with them. 1. Present Application Form for VAT Refund, passport or other designated travel document, purchased goods to be taken out of the country, and original copy of uniform invoice to Customs officers. 2. 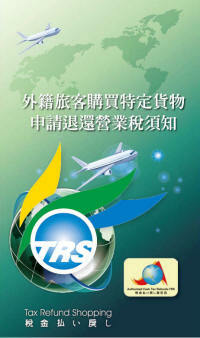 After verification, Customs officers will issue a "VAT Refund Assessment Certificate." 3. Present "VAT Refund Assessment Certificate" to designated bank at airport or seaport for issuance of refund due.